Healthy choices don't always come with the option for great taste... but this one does! 4Life's NutraStart health drink is packed with hearty health essentials like 10 grams of fiber, 18 grams of soy and whey protein, vitamins, minerals, and immune-boosting Transfer Factor E-XF. The extraction process for transfer factors from chicken egg yolk is protected by US patent 6,468,534; exclusive combination techniques for transfer factors from cow colostrum and chicken egg yolk is protected by U.S. patent 6,866,868. Soy Protein Isolate, Whey Protein Concentrate, Transfer Factor E-XF™, Sunflower Oil Creamer (high oleic sunflower oil, corn syrup solids, sodium caseinate (a milk derivative), mono- and diglycerides, dipotassium phosphate, tricalcium phosphate, soy lecithin, tocopherols), Polydextrose-Litesse II, Xylitol, Maltodextrin Fiber, Natural Flavor, Fructose, Soy Fiber, Vitamin and Mineral Blend (calcium, magnesium, ascorbic acid, vitamin E, niacin, iron, zinc, d-calcium pantothenate, pyridoxine hydrochloride, copper, riboflavin, vitamin A, thiamin, folic acid, potassium, cyanocobalamin), Cellulose Gum, Stevia, Salt. "The NutraStart vanilla and chocolate shakes have been great for me. I alternate strawberry and banana with vanilla, and chocolate with banana. It gives me a great start to my day and gives me plenty of energy." 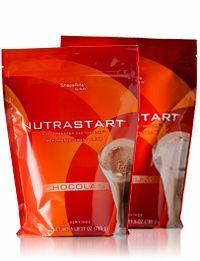 "I am so excited about the NutraStart meal replacement. I love it! It’s something that I have personally needed for so long. We’re busy building our business, and oftentimes, I would just rather have something nutritious and quick that I could prepare, rather than grabbing something that isn’t as good for me. I’ve actually been replacing two meals, my breakfast and lunch, with it, and having a real healthy, full dinner with regular exercise."